What is the Emergency Child Care Bridge Program? Lack of child care is a barrier to successful placements in foster care, as potential caregivers often must go to work or attend school. Therefore, the State has allocated $31 million, to provide counties the option to create emergency child care bridge programs. It is important to note that each county that wishes to participate must opt into the program, and not every county will likely accept the state funding or create an emergency child care bridge program. First: recipients of the bridge program will receive a child care voucher. This voucher is available for six months, but a county is allowed to extend the voucher for an additional six months if the family is unable to secure long-term, subsidized child care. Second: a recipient of the bridge program will be assigned a child care navigator. The navigator is supposed to help the family secure long-term child care. The navigator will be available to assist with any necessary applications for child care resources and ensure that families are informed regarding the benefits of child care. Third: all child care providers may receive trauma-informed training and coaching. 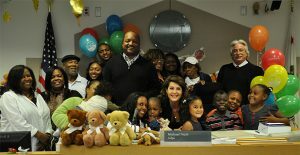 This will help ensure that the child care providers understand the needs of children in foster care.Caregivers do not need to be approved as resource families to qualify for the child care bridge program, but which caregivers actually receive the voucher will be up the each individual county. A best practice would be for a county to provide an emergency child care bridge voucher to caregivers at the time of placement to ensure the child’s and family’s success, and to bridge the period of time between placement and when long-term child care becomes available.Counties that wish to opt in to the Emergency Child Care Bridge Program must submit a plan to the state by November 30, 2017 to receive their portion of the state funding for the purpose of creating a county program. The state’s All County Letter 17-109 and a recent webinar provide more information about how a county may opt into the program. ← If a relative caregiver was approved prior to 2017, do they have to complete the entire Resource Family Approval (RFA) process if another child comes into their care this year?